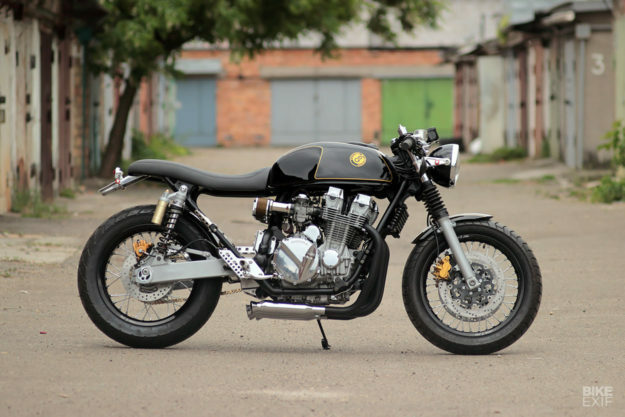 ‘Perfectly insane about motorcycles’ is how friends and colleagues describe Nazar ‘Gazzz’ Poznyakovsky of Gazzz Garage in Kiev, Ukraine. With that much control over every step of the process, Nazar has a reputation as a detail-obsessed майстер на всі руки (Jack-of-all-trades). And he’ll stop at nothing to execute his vision for a project. 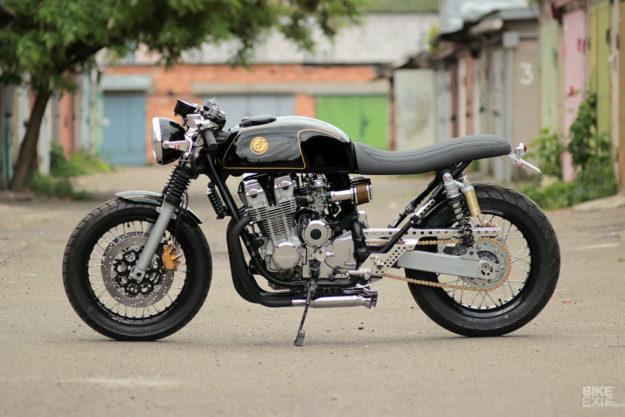 Case in point is his latest achievement, a beautifully remixed CB750 with class, artistry, detail, and power. 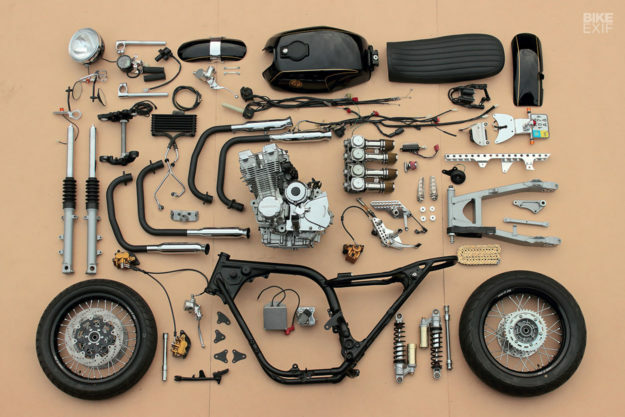 The front forks, the lower triple tree, the front of the frame and some engine parts are all that stayed from the donor. 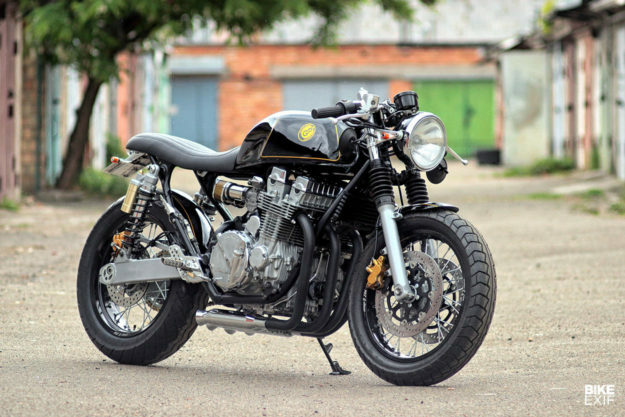 The engine is a masterful hybrid of the classic CB750 mill and its more powerful but problematic successor, the CBX750. 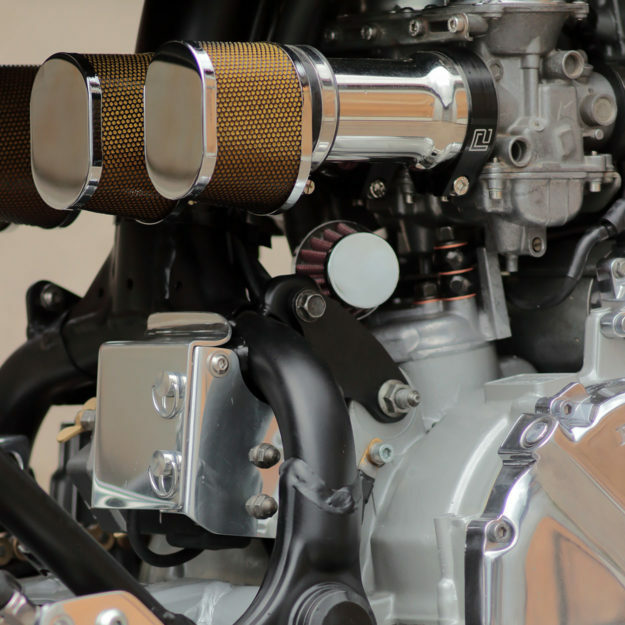 “The CBX creates an additional 20hp and 9Nm at the crankshaft, but the oil system frequently caused rods to be thrown through the case,” says Nazar. 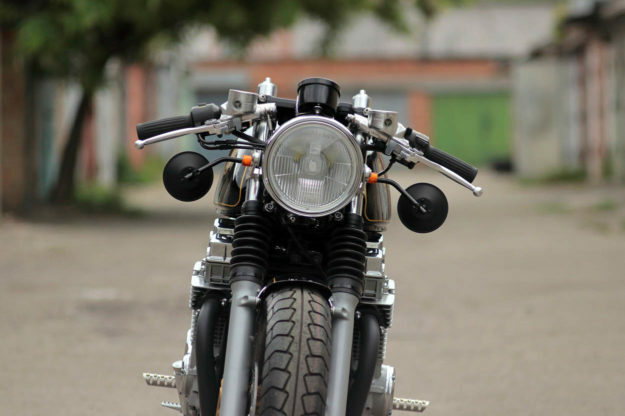 “This and other issues were completely solved in the CB750 engine, so I decided to take best of both engines”. 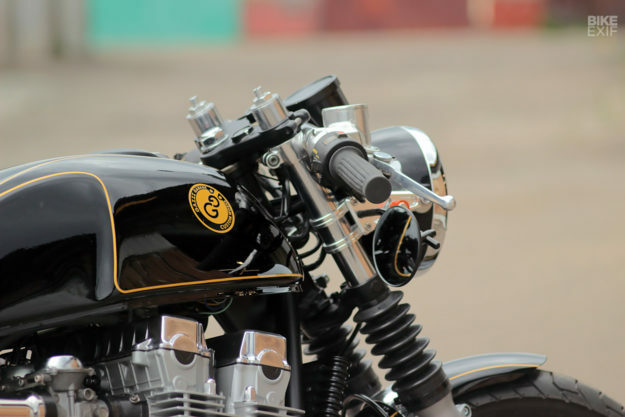 By combining the two, Nazar wrought a new heart with a six-speed gearbox, a hydraulic drive clutch, a better crankshaft, case, and oil system, and a cylinder head with larger valves and performance cams. To finish off the performance mods, Nazar ported and polished the heads, and made a stainless steel intake system. 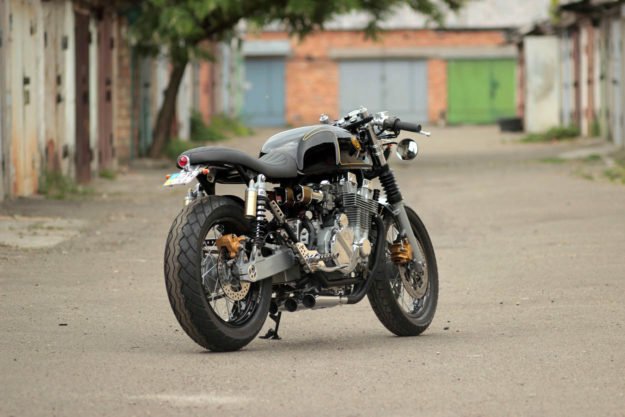 Re-jetted carbs breathe through Kijima pod filters, and a 4-into-4 exhaust provides the “soul-catching” growl and bark. 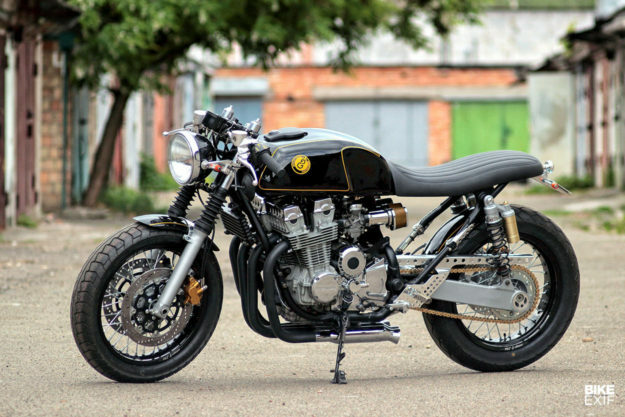 At the top, Nazar replaced the CB750 tank with one from its odd-duck cousin, the CX500. 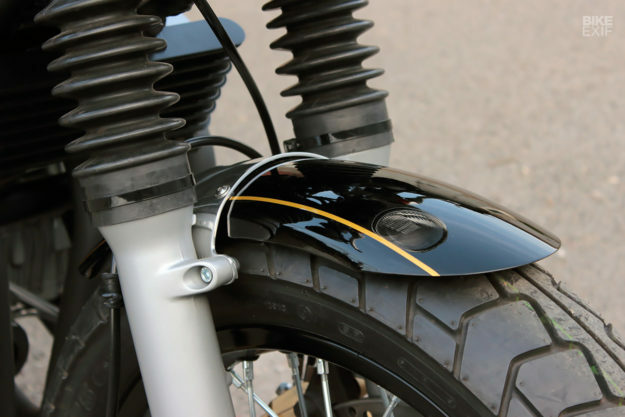 After treating the tank to custom paint, Nazar fitted a new cap with a modified lock and a Moto Guzzi fuel petcock. Moving forward, Nazar sourced an upper triple clamp from a 750 Nighthawk that was more suitable for clip-ons—while retaining the original 41mm fork tubes with preload adjusters. 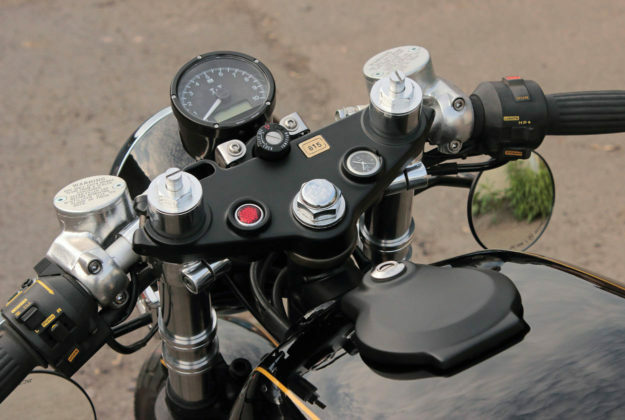 Completing the cockpit is a T&T ‘all-in-one’ dashboard and a T&T oil temperature gauge, sitting behind an 8-inch British style headlamp flanked by custom made LED turn signals. Attached to the front forks is a custom front hub. It’s mated to a Warp9 17 x 2.5 rim with custom made spokes, with a Dunlop K375 tire sweetly hugged by a custom made steel mudguard. 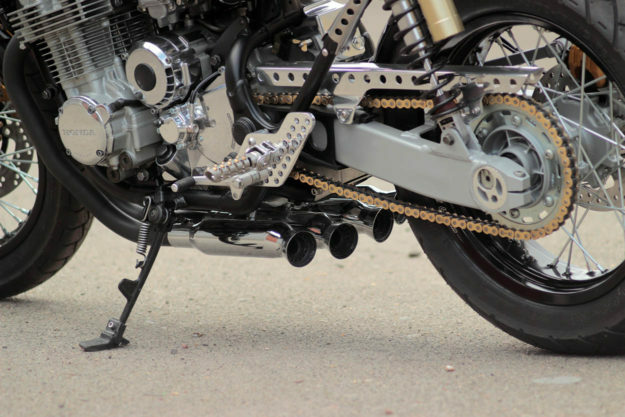 Front braking is provided by twin 300mm discs with Nissin dual piston calipers attached to a Kawasaki Vulcan 1500 master cylinder, by way of Hel braided brake lines. The rider now sits on a custom seat (and aluminum pan) fabricated by Nazar. Underneath is an aluminum swingarm from a Kawasaki Zephyr 750, and between the rails is a Honda Translap 650 rear hub. This time, the Warp9 wheel is 17 x 4.25 and shod with a chunky 160/70-17 Bridgestone G528 tire. Keeping everything in place are Kayaba fully adjustable rear shocks with custom made adjusters. 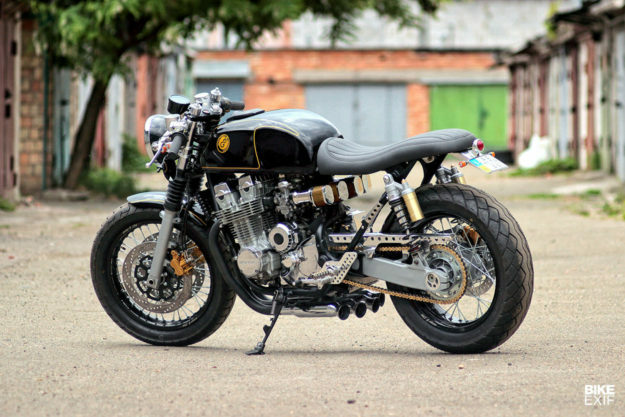 This CB750 is a good 20 kilos lighter than the source bike, and details are plentiful—right down to the custom footpegs and chain guard. As a one-man shop, Nazar is undaunted by the unknown. And he’s brought to life a beautiful vision, despite living in a part of the world where parts availability is, at best, challenging. Astounding work from the madman in Kiev.